No. Butte residents don’t need to worry about flood insurance in regard to the Berkeley Pit and connected underground mine workings. The Berkeley Pit and connected tunnels act as a sink that collects groundwater in the area. 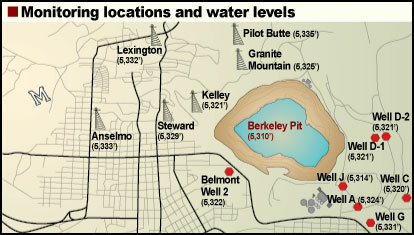 Water levels in the Berkeley Pit and associated mine shafts are currently 175 to 200 feet below the rim of the Pit. Elevations above sea level for Berkeley Pit water and surrounding Butte, Montana landmarks. Image from Google Earth. Click on the image to view a larger version. The lowest point on the Pit rim, on the east side near the Montana Resources concentrator, is 5,509 feet above sea level. As of June 2013, the Berkeley Pit water level was 5,310 feet, and the highest water level in the system, in the Pilot Butte shaft, was 5,335 feet. Under the management plan for the Berkeley Pit, these water elevations will always be maintained at levels 100 feet or more below the rim. This will be accomplished by pumping and treating Berkeley Pit water. Pumping and treating will start when the water level at any one of the monitoring compliance points reaches the critical level of 5,410 feet. The Montana Bureau of Mines & Geology (MBMG) monitors water levels at all compliance points, as well as at several other monitoring sites, on a monthly basis. Based on the rate the Pit is filling now, that should happen around 2023. Berkeley Pit groundwater monitoring locations and water levels, including wells and abandoned mine shafts, June 2013. The elevation of the Metro Storm Drain near the Pit at Texas Avenue and Continental Drive is 5,470 feet, about 60 feet above the highest water level allowed for the Berkeley Pit system. For further comparison, a monitoring well at Greeley School has an elevation of 5,503 feet, about 93 feet higher than the critical level. The current water level in this well is 5,462 feet, about 52 feet higher than the critical level. This difference in water levels tells us that groundwater is flowing toward the Pit, and will continue to do so after the waters in the Berkeley Pit and connected mines reach their highest allowed levels. In other words, water is flowing into the Berkeley Pit, and the Pit will be managed so that water is always flowing into it. 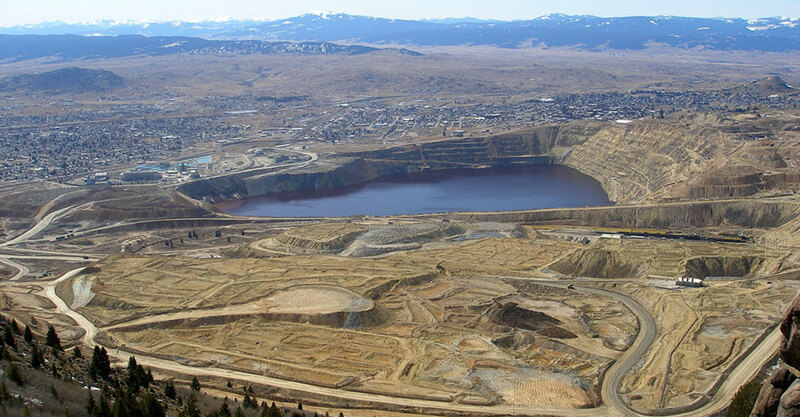 Butte residents can rest easy knowing that the Berkeley Pit is not going to overflow, and that there is no need for flood insurance due to the Pit or underground mines. This image illustrates how the Berkeley Pit, with the lowest water levels in the area, acts as a sink that collects groundwater. Water levels indicated for each monitoring point are from June 2013. Click on the image to view a larger version.